The macaques are a genus (Macaca) of Old World monkeys of the subfamily Cercopithecinae. The 22 species of macaques live in sub-Saharan Africa, and more widely in Asia. One species is the well-known Gibraltar 'ape'. 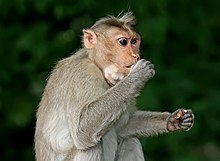 Macaques are of some interest to human researchers for their social structures, and their usefulness in animal testing, particularly regarding eyesight. In 2014 selfies taken by a crested black macaque seemed to establish a legal precedent, after the Wikimedia Foundation rejected a copyright claim. The photos had been sold widely by David Slater, a professional nature photographer, whose camera was temporarily carried away by a group of macaques. After the photos were uploaded to Wikipedia, the organisation refused to delete them, claiming "This file is in the public domain, because as the work of a non-human animal, it has no human author in whom copyright is vested. ↑ The Life of Mammals, presented by David Attenborough, 2003 British Broadcasting Corporation. BBC Video. ↑ "Wikimedia refuses to remove animal selfie because monkey 'owns' the photo". Fox8 News. Fox8 News. 2014-08-06. Retrieved 2014-08-06. ↑ Sparkes, Matthew (2014-08-06). "Wikipedia refuses to delete photo as 'monkey owns it'". The Daily Telegraph. London: Telegraph Media Group. Retrieved 2014-08-06. This page was last changed on 19 April 2019, at 18:37.